Monster is one of the leading names in earbuds, especially for exercise enthusiasts who want the best in high-quality audio and noise isolation. Monster iSport Victory headphones are at the higher end of the market, with a retail price tag of $149.95. That price might sound steep, but it’s actually a bargain when consumers consider exactly what these earbuds offer. In addition to a distinctive style characteristic of Monster earbuds, the iSport Victory lineup features a SportClip feature that locks earbuds in place during vigorous workouts. The earbuds feature an exceedingly high level of noise isolation, which cancels out ambient gym noise, the sounds of traffic during a run, or even the sound of the opposing team’s cheering section during a big game. The earbuds come in several different colors, making them a great accessory for devoted athletes and exercisers wherever they prefer to get their daily burn. The SportClip design gives the earbuds a resting point outside the ear, which means that gravity won’t yank them out even when athletes use a wide range of motion or pick up the speed on a daily run. The ControlTalk inline mic and remote control interfaces with iPods, iPhones, and iPads, allowing users to switch tracks, adjust the volume, or answer and end phone calls, without touching the device. Monster uses its own, innovative sealed earbud housing that keeps sweat and other elements out of the internal components. A tangle-free, flat cable design adds peace of mind and ensures that these headphones can be quickly and easily put to use daily. High levels of isolation, combined with excellent audio quality, block out ambient noises and give music an immersive level of quality that adds a bit of motivation to the daily workout routine. Monster’s iSport Victory earbuds are designed to do exactly what their name might suggest: Work well in sports environments and propel their users to victory. They do this in several ways, the most essential of which is the SportClip system that keeps the earbuds in place while running, lifting, or playing a game. The clip rests on the outside of the ear and acts as a point of balance of the earbuds, which might otherwise wiggle lose and fall out over time, especially when sweat enters the picture. SportClips come in a variety of colors, ranging from black and white to neon accents. They adjust automatically with different earbud sizes, fitting every ear in an individual way. 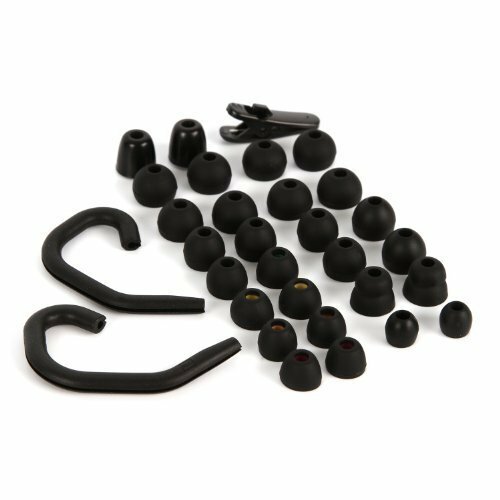 The SportClip system allows the actual earbuds to remain lodged tightly in the ear, which is essential for the best audio quality when using an in-ear model. Monster also ships the iSport Victory earbuds with several different tips for smaller, larger, or more moderately sized ears. These tips come with a slightly tactile exterior coating that holds onto the ear and further resists the forces of gravity and the plight of swinging headphone cables during a workout or run. Users who have been utilizing these buds on a daily basis since their mid-2013 release note that audio quality is far superior with the iSport Victory earbuds than with virtually any other option in the same price range, with booming base and enough clarity to hear backup vocals even during harder workouts. The earbuds come with a unique, moisture-tight enclosure that blocks out sweat and the elements, giving the earbuds added durability. An included ControlTalk remote system, which allows for control of phone calls and music without touching the phone, will also keep the phone itself free of moisture or sweat marks. All told, the commitment to both convenience and durability with these corded, in-ear earbuds, is second to none and has earned scores of five-star reviews on sites like Amazon as a result. A few problems arise with the Monster iSport Victory earbuds that are actually pretty common among all traditional headphones currently on the market. The use of audio cables, rather than Bluetooth connectivity, has seen some users complain about the durability of those cables over an extended period. Many complain that the cable tends to fray close to the right-angle headphone jack or near the ControlTalk remote control that interfaces with the smartphone. This could significantly shorten the useful life of the earbuds, as audio quality may suffer and one or both earbuds may lose sound. Others note that the right-angle headphone jack, while sold as a convenient feature, is actually not as convenient as the company claims. Because most smartphones use a straight-in headphone connection, the right-angle jack causes the cable to bend excessively. When combined with friction in the pocket, some reviewers and consumers note that this causes quick fraying of the wires nearest the connector, limiting the longevity of the earbuds in some cases. Despite occasional reports that call into question the quality of the cables or the utility of the right-angle headphone jack, Monster’s iSport Victory earbuds still offer excellent noise isolation, impressive audio clarity and bass quality, and excellent stability in the ears that makes working out just a bit easier and more enjoyable for the typical athlete.